Today was a whole lot more like what cruising is supposed to be! Sunshine! Light to no wind! Snorkeling! So how the heck did we get here? 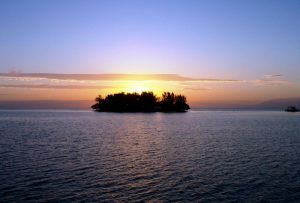 Well – we stayed at Tobacco Range until Friday, November 16 – deciding that when we finally got a weather window to get out to the atolls, we’d have to wait there for a window to get back – and as of the 16th, we calculated only five more weeks until our reservation in Panama. 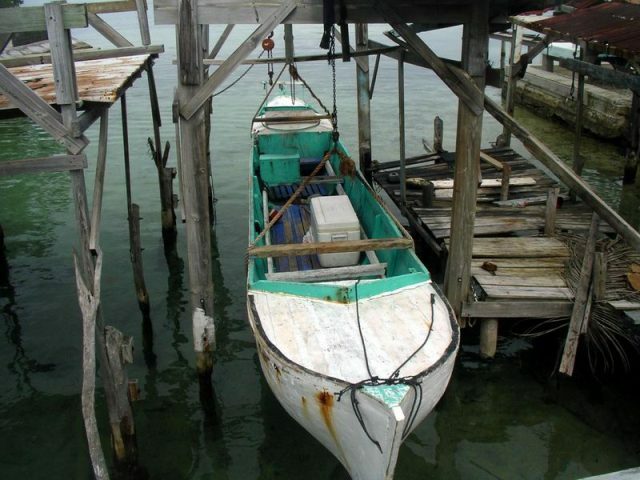 The boats with us in Tobacco Range all swear by the Caribbean weather guru, Chris Parker, who broadcasts three times a day and does weather routing for his subscribers. If some of his subscribers happen to be heading the same direction as we are, so much the better for us! So based on Chris Parker’s advice (to other boaters who are less tight than we are) we opted to make the first jump east on Friday at about noon, making about a 90-mile crossing. 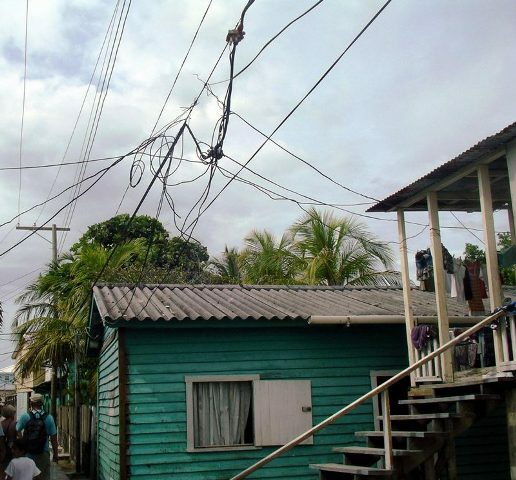 Frankly, we’ve had worse – if this is as bad as we get during our travels to Panama, I’ll thank Neptune or whoever else is in control of such things. We had fair winds of 12-15 knots, and 4-6 foot seas off the port bow. 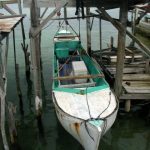 Now compared to Rio Dulce, it was rough – but compared to our little jaunt down the coast of the Yucatán, it was a rocking chair. The only challenge was arriving at 12:30 in the morning, in an unfamiliar harbor, where the prevailing northeasterly winds had suddenly shifted to southwesterly, making our anchorage for the night a bit of a ride. 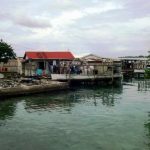 We kept hearing on the radio that several boats were anchored someplace called “the Utila Cays” – which aren’t listed as such on the chart or in any cruising guide. So we called them on the radio and asked for directions, heading over in the late afternoon to a beautiful little lagoon and anchored in 45 feet of water near three sailboats: Tempest, Wind Free, and Attitude. Torrey had given us some parts for Tempest anyhow, so Tempest Bob motored over with the postage – the local beer here is “Salvavida” – means “life saver” in Spanish. Apt. Shortly after we anchored, a local woman in a kayak paddled up and offered to sell us a side of fresh snapper – must have been at least 5 lbs! 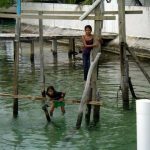 Her name is Wendy, and she is apparently the “bad girl” of the island, trading her favors to the fishermen for fish that she sells to boaters to finance a drug habit. She seemed friendly enough, lucid, and pleasant. 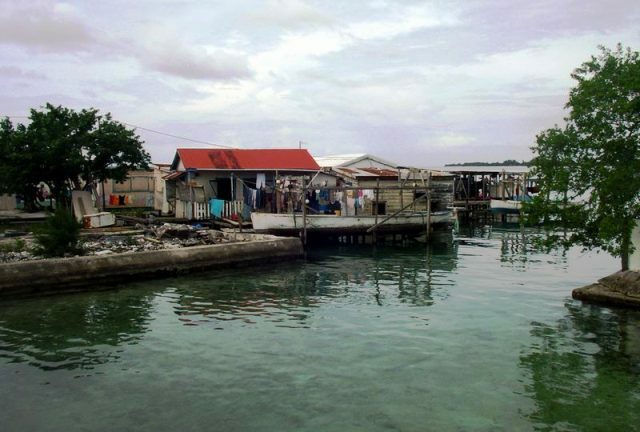 The more we do this cruising thing, the more willing I am to live and let live – a community as small as Utila Cay needs one of everything. We spent Sunday on our own, puttering around the boat trying to glue the dinghy back together (that’s another story for another day), and got invited over to Neil and Cathy’s Attitude for cocktail hour and pictures of a dive Neil did with great white sharks for his 60th birthday. I had always suspected that sailboaters had a different mindset than us “trawler trash,” but jeez – to PAY somebody to put you into the water after they’ve chummed it with dead tuna and summoned oh, 10 or 20 great white sharks – sorry, I’m afraid that merits a stronger word than “different.” The oohs and ahs were punctuated by yums and wows, as Neil is a bit of a “foodie,” and had some wonderful snackies including real cheese. All in all it was a great evening. 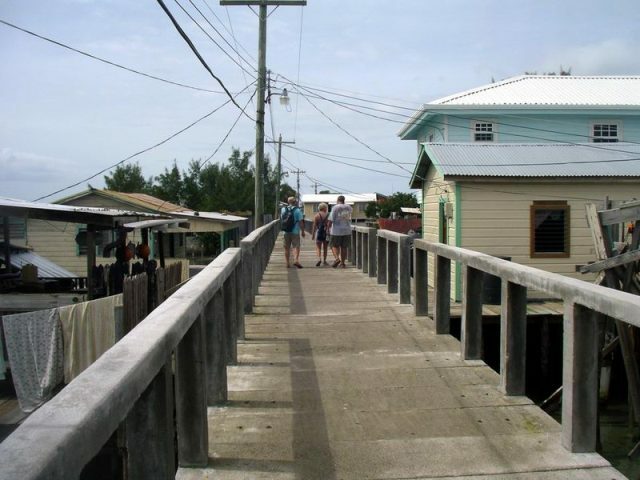 Monday we sped over to the town on the biggest of the cays. 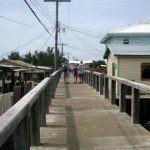 It’s a cute little berg with about 600 people, 3 or 4 tiendas, 3 or 4 churches, and no street – just a wide sidewalk that runs pretty much the length of the cay, about a quarter mile. 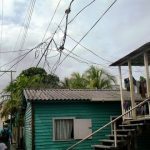 They just got electricity three years ago, and the infrastructure is primitive at best, but we did pass one house with four satellite dishes. He’s the local media conglomerate. Overall we were impressed by the cleanliness and order of the place. 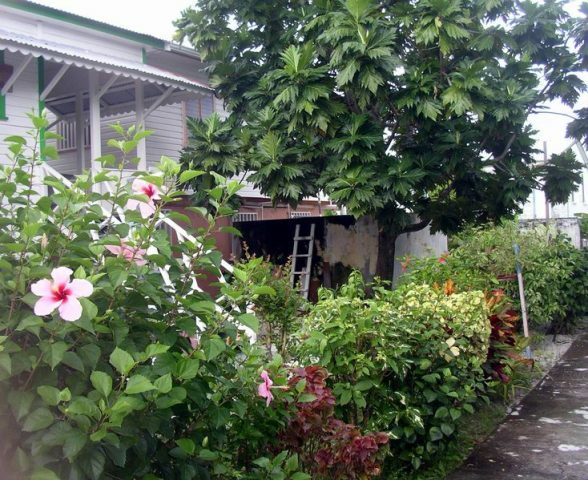 Most of the houses were freshly painted and many had beautiful gardens of croton, hibiscus, trumpet flowers and ginger. As we were returning to the boat, we met a guy in a speed-dinghy who invited us to his house for cocktails that afternoon at 3:00. 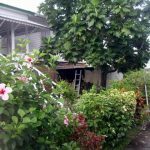 Bobby Thompson bought his house about 3 years ago from a missionary who built it as a dream then developed health problems. I don’t know what he paid for it, but given that Bobby was in the offshore oil industry, the missionary business in Central America must be pretty profitable. It’s a hell of a property. The house, at least 5000 square feet, has full suite accommodations on both levels, a full solar panel array on the roof, backup generator, both a rain catchment and reverse osmosis watermaker, a white sand beach he’s built with breakwaters, beautiful grounds patrolled by an exhuberantly retarded Labrador retriever named “Splash” and a watch-toucan who’s meaner than snot. Part of the property’s charm is a long dock with a palapa bar built as a tower on the end – where all of the boats at anchor assembled as Bobby’s guests. After a bit of Flor de Cana lubrication, the purpose of the invite became clear. Bobby wanted a focus group of boaters about what he could do to provide better service to boaters, as he’s noticed an increase in the number of boats that anchor in front of his property. He doesn’t want a full-on business, but wondered what kinds of low-maintenance, honor system services he could provide. Said his wife would kill him if he ran a business – he’s supposed to be retired! He was a charming, gracious and generous host, and told us we were welcome to come ashore and stroll his property any time. Just at dark, a squall blew up, so we sped back home and hoisted up the dinghy. Tuesday’s weather was crap. All day. It makes me grumpy. We did not embark on this venture to stay tucked inside while at anchor in the Caribbean! Wednesday, on the other hand, for Ole’s birthday, Ra was out in full force. I spent the morning making two cakes – one for the birthday boy and one for Thanksgiving dinner. Ole continued to glue the dinghy. After lunch, off we went to find some snorkeling, with Tempest Bob and Annette and Dave from Connie Marie, who joined us in the anchorage Monday night. Had a wonderful time, seeing plenty of damselfish, angelfish, tangs and parrotfish among the coral, sponges and sea-fans. Colors here are good – with some of the sponges being crimson, cobalt, and turquoise. My favorite fish was a juvenile damselfish who was cobalt blue with neon turquoise polka-dots. I can’t help it – snorkeling makes me feel like a little kid – when I see the fish going about their daily lives, my mask leaks from smiling. The glee factor raged on, when upon return to the mothership, frozen pina coladas appeared. Two tall ones, feet up on the back rail, contemplating the complexities of life. Then it was time for Ole’s quiet birthday fiesta, with puyaso from the meat lady in Guatemala, garlic mashed potatoes and the last of the fresh broccoli – add red wine and a concocted recipe for chocolate-Tia Maria cake, and the day was complete!